We’ve rented dozens cars all over the world – from the backstreets of Bali to the mountains of Transylvania, and the rolling emerald hills of Ireland to the Caribbean coast of Mexico. We have a deep understanding of hidden rental fees, country-specific gotchas, international drivers licenses, roadside repairs and pretty much any other possible thing that can happen on the road. Yes, I’d say it’s pretty safe to call us an authority on car rentals. So when I first heard about Turo, a peer-to-peer (P2P) car rental platform, I knew straight away this was going to be a gamechanger. Airbnb has shaken up the short-term accommodation market. Uber has done it to taxis. Now Turo is taking on car rentals in the same vein. What The Heck Is Turo? Turo is a platform that allows car owners to safely rent their car to complete strangers. Well, not completely, as Turo takes care of identity verification for each driver. But it’s a neat way for owners to make a bit of extra money, and on the flipside travellers can conveniently rent a car for a lot less than through traditional rental agencies. Discount: Use our unique link to save $25 off your first car rental with Turo. As a traveller/driver, you can start searching the website (or mobile app – iOS, Android) without an account. When you’re ready to rent a car for the first time, a one-time-only identity verification process is started. Depending on the information you provide, most of it can be done online within a few minutes (eg. submitting a photo of your passport and driver’s license). I’d recommend getting verified in advance so it doesn’t slow you down in case you need a new rental car pronto. Tip: If you’re travelling with friends or family and need multiple drivers for your car, each driver will require their own verified Turo account. Your next Turo journey starts with a search. Simply enter a city or street in the search field, and a list of available cars will show up. Want to refine the list? Use the “category” filter at the top to choose from options such as “family friendly”, “backroads ready”, “fuel sippers” and more. This makes it super easy to find the best car to match your upcoming trip. Further filtering down the left side of the page includes: price, vehicle type, vehicle make, curbside delivery, distance (from your desired location), transmission and more. I tend to plan our travels on a Google Map, so I can see the proximity of attractions, accommodation, and eateries. So Turo’s search map view makes it even easier to find a pickup location close to you. 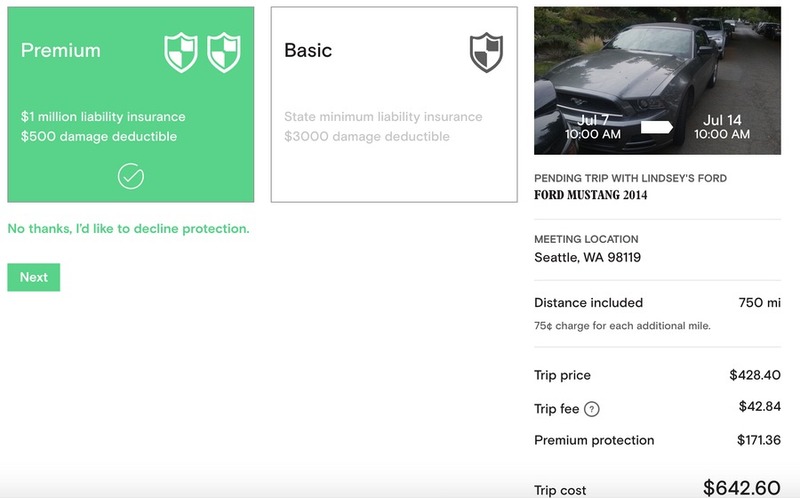 Each car owner can set their own policies for car pickup charges. Some offer delivery for free, and others for a small fee. Or in our case, since we were going to rent the car for a while, they offered free pickup. The car detail page has everything you need to know: pricing, longer-term discounts, make, model and year, description, iconised features (such as GPS, automatic transmission, etc), miles included, owner response time, and most importantly – reviews from previous drivers. Once you’re happy with your dates and the price, the next step is choosing a pickup location. The checkout process is ultra streamlined; each page only displays the essential information you need. The “trip fee” which incorporates liability insurance, emergency roadside towing and payment processing fees is clearly shown. The final step is choosing “protection”. It sounds like something out of a Godfather movie, but it just means insurance options. Typically, with traditional car rental agencies, insurance can be a convoluted topic. Here you’ve got 3 simple options: no protection, basic (15% of trip price) or premium (40% of trip price). The damage deductable (how much you pay out of pocket in case of an insurance claim) is very clear, and the subtotal on the right side gets updated dynamically. Easy. And you’re done. The booking is saved on your account for easy access. Making changes to the booking or even cancellation can be done online. The owner’s direct contact details are provided if you wish to call. And in the unlikely event there’s any problems with the car, you can upload photos as well. Lower prices – this is the #1 reason why most travellers choose one agency over another, and Turo wins out almost every time. Flexible pick-up locations. Options include: airport, the owner’s location, or a custom location agreed between the renter and owner (that’s door-to-door service!). You get what you see. Most rental agencies show generic photos on their websites, and at pick-up time, you have no idea exactly what you’re going to get. What you see on Turo is what you get. Wider range of cars – want a vintage van for an epic road trip? Or perhaps a hybrid convertible to impress your friends. You’re covered. Simple, refined booking process – searching for the right car is a breeze. And pricing for travellers is transparent, without layers of complicated fees. Optional insurance is usually cheaper than traditional car rental agencies (especially compared to ridiculous insurance prices in Mexico). Inspiration – need some ideas for a road trip? Turo offers inspiring ideas from other travellers. Payment is made upfront, at the time of the booking (most traditional agencies only charge your credit card after returning the car). Emergency roadside and collision assistance is provided via a 24-hour hotline, but depending on the nature of the call you may be responsible for the actual services (towing, battery jump, etc). Flat tyres are the traveller’s responsibility. Protection (insurance) rates are slightly different in Canada. Turo’s cancellation policy is pretty generous. If you’re under 25 years old, a “young driver fee” of 20% is added to the trip price. In some cases, a security deposit is required, the conditions are a bit vague. More details can be found here. You can only rent one car at a time, there should be no overlaps. Smoking is not allowed in any Turo cars. If you end a trip early, you won’t get any money back for unused days automatically – you have to request the change with the owner and wait for their approval. Be careful if you’re relying on your credit card’s perks for rental car insurance because many credit card companies don’t consider Turo a “rental car company”. It’s best to call your credit card provider to clarify the specifics of coverage. We booked a car in Seattle for an upcoming trip. The whole process was stress-free, and easy. Once the trip has been completed, I’ll update this article with a summary of our experience and a couple photos. While there’s a lot to love about Turo, it has some short-comings. Most of these things on this list are expected for a young, growing company. There’s still more refinement to be done on the platform, and more cities to rollout. It’s not everywhere yet (in North America). On our upcoming trip to British Columbia, Canada we had to pick up a car in Seattle, Washington. The US coverage is good, and gradually getting better, but outside the US & Canada, you’re out of luck (for now). Owner communication tools can be improved. While the car descriptions have a lot of info, if there’s still a pre-sale question to ask the owner, there’s no way without renting the car first. So for now, some owners include their email address within the listing, which isn’t good for Turo and is a less-than-perfect solution for travellers. Some travellers don’t feel comfortable booking something over the internet when a lot of money is involved without direct communication with the seller. I can relate to that. Insurance “protection” price is not shown until AFTER entering the billing information. And it seems that by that point a hold is made on your credit card. A relatively minor complaint: the checkout process doesn’t have a “back” button (other than small “update payment method” link. If you change your mind about the dates, you have to use the browser’s back button (all the payment details are saved though). Even those I’m focusing on using Turo as a consumer (driver), it’s also an easy way to make some extra cash as a car owner. 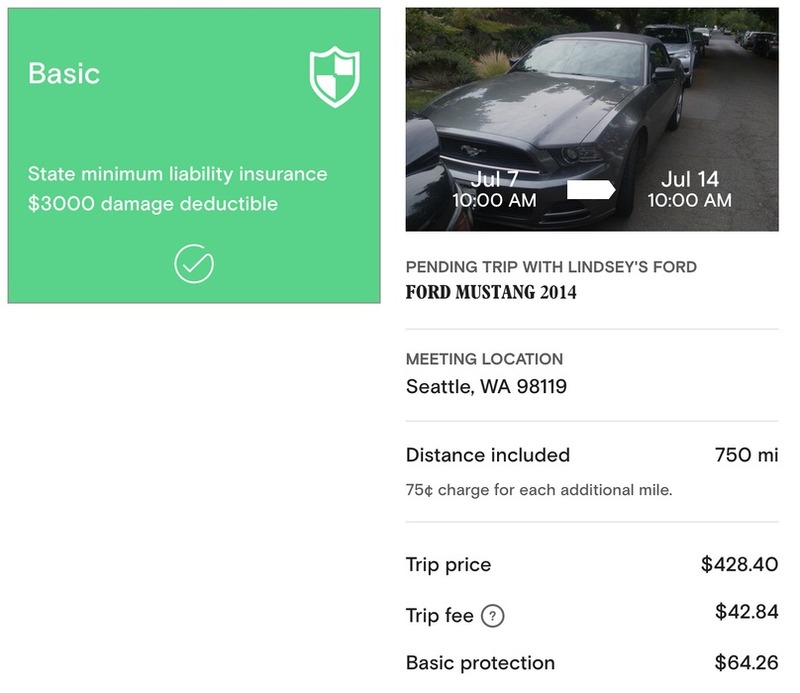 Turo takes care of the insurance, billing and even automatic pricing (however, you can set your own pricing if you want). In any unfortunate situations, Turo acts as a mediator to ensure your car is fully protected. Turo is a platform that will change the car rental industry forever. It’s as simple as that. The groundswell of peer-to-peer commerce around the globe is only growing, showing no signs of slowing down. I’m very excited about the future of Turo. This newfound flexibility and wider range of car choices will only mean a better travel experience for consumers. And car owners can make better use of their vehicles (and income in the process). Plus more efficient use of cars on the roads means less pollution. Now for the toughest choice… where should we go on our next road trip? Genius ! But I won't t be using it until you can see the full price, including insurance, up front. Love all these new ideas that put more power in the hands of the people rather than big companies. This is awesome! Can't wait until this reaches New Zealand. I have a car I don't use much - would be great to get some extra money on the side! Thank you for this very balanced review. The concept does sound intriguing, though I wonder what actually happens in the event of accidents. With conventional car rental companies, they can come to our rescue and even provide another vehicle for us to complete the rest of our road trip. But how would that work out on a Turo rental? This would be an instant hit in Nairobi. There are many car rental companies, both international and local, but people are always looking for car rental deals. Peer-to-peer is there perfect solution. I rented a Turo car at Boston Airport last week and a nice experience. Cheap, fast, easy! I would strongly recommend this service. I have rented from Turo twice before without incident. However, I recently booked a trip for 5 days a week in advance. Eight hours before pick-up I received a cancellation message from the owner. I immediately contacted Turo. There were no other vehicles of similar capacity in my area that were even close the price range I had paid. Turo offered $75 credit as their max. 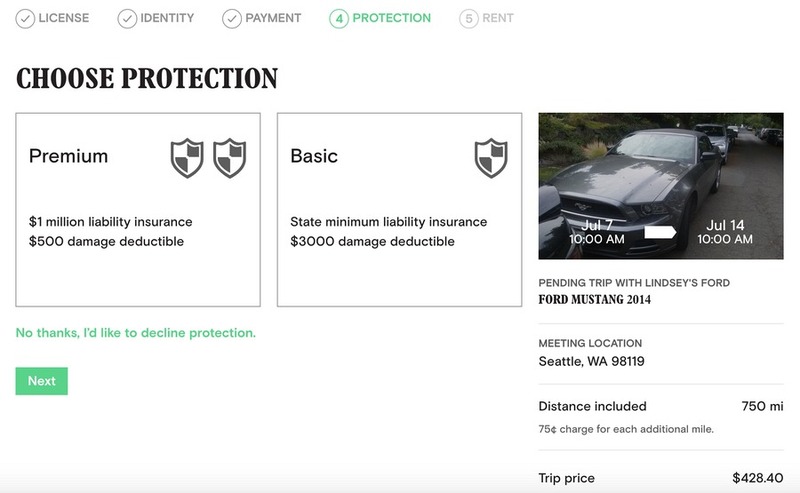 If Turo is trying to build a reputable company, they need to institute a policy that if owners do not abide by the 72hr cancellation rule then Turo engages a stricter policy with the car owners and Turo pays the difference in the rental fee for the customer. At this point car rentals were 3-4 times the amount we had originally booked. Very, very frustrating. I will NOT be using Turo again after this experience. I'd much rather pay a little more to a reputable car rental company and have the knowledge that I will not be left high and dry simply because an owner changes his/her mind.